Chamorro Special Sauce — that’s what my non-Chamorro friends call fina’denne’, the literal translation of which means made with pepper or donne’, the Chamorro word for hot chili pepper. There are many, many ways to prepare fina’denne’. Soy sauce is usually the main ingredient; however, depending on the type of dish being served, you may choose to use salt instead. For instance, I prefer a salt-based fina’denne’ over grilled fish, but I love a soy sauce-based fina’denne’ over fried fish. The acidic ingredient is all up to you as well. You can use white vinegar, cider vinegar, coconut vinegar, lemon juice or lime juice…it’s all up to you. My brother, for example, likes only lemon or lime juice in his fina’denne’. I, on the other hand, like to vary the acid I use depending on what I’m eating. I mentioned fish above…I like a soy-lemon fina’denne’ with fried fish, and either a salt-lemon or salt-white vinegar fina’denne’ with grilled fish. 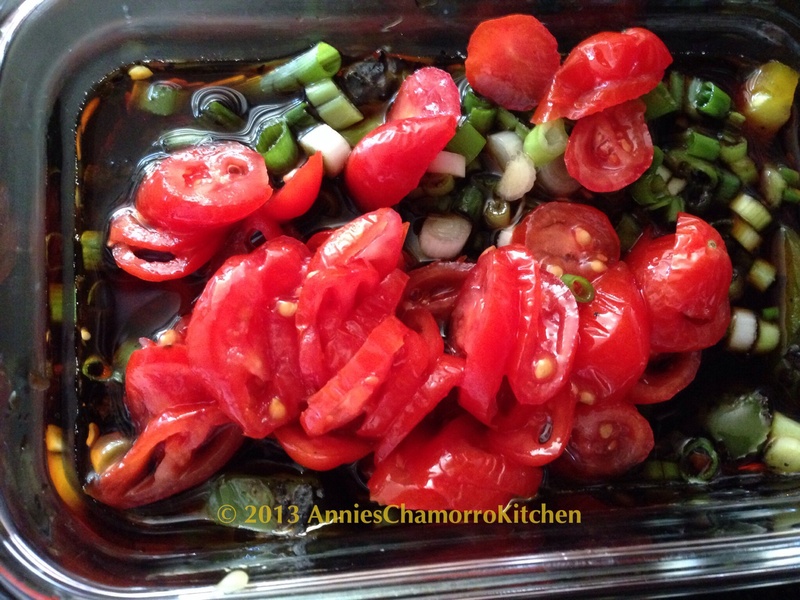 I also like using white vinegar when I add tomatoes to my fina’denne. Tomatoes and vinegar pair really well, you know, like how a vinaigrette dressing goes great with a tomato salad. Be sure to taste as you go…you might like your fina’denne’ more on the salty side, or you might prefer it a bit more sour (which is how I like it). I like a 1:1 ratio of soy sauce to vinegar. My husband prefers his fina’denne’ on the salty side, so when he makes it, he uses a 2:1 ratio of soy sauce to vinegar. In other words, if I were to make a cup of fina’denne, I’ll use 1/2 cup soy sauce and 1/2 cup vinegar. My husband, on the other hand, will make his using 1/2 cup soy sauce and 1/4 cup vinegar. 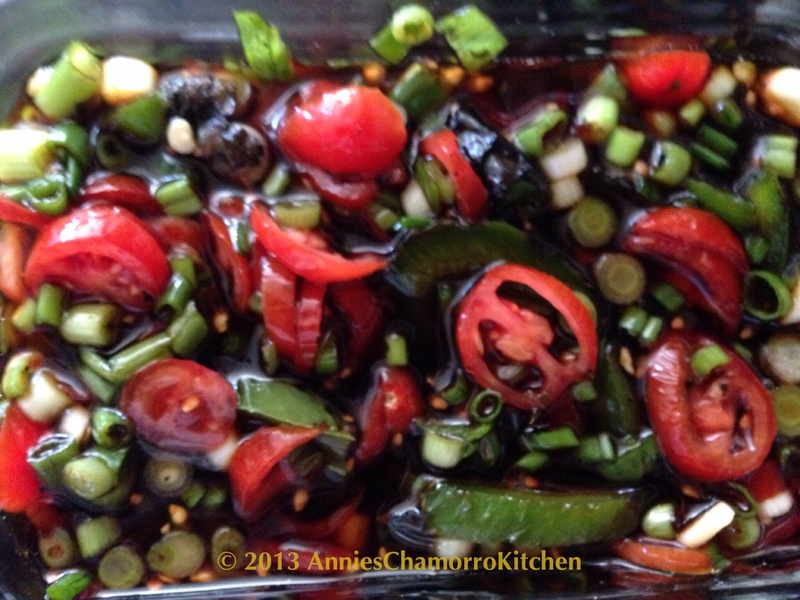 In a small bowl, mix together the soy sauce and vinegar (or lemon juice if you prefer). 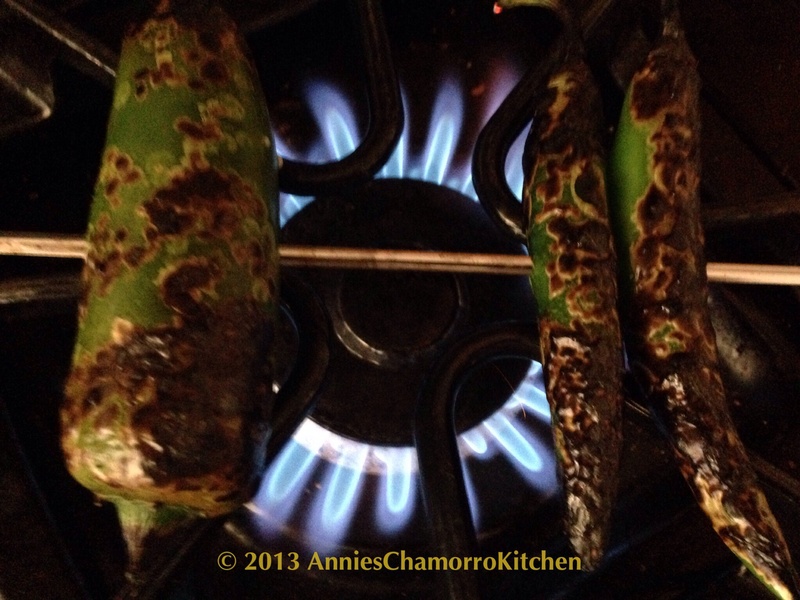 I like adding hot green chili peppers to my fina’denne’, charring them slightly. 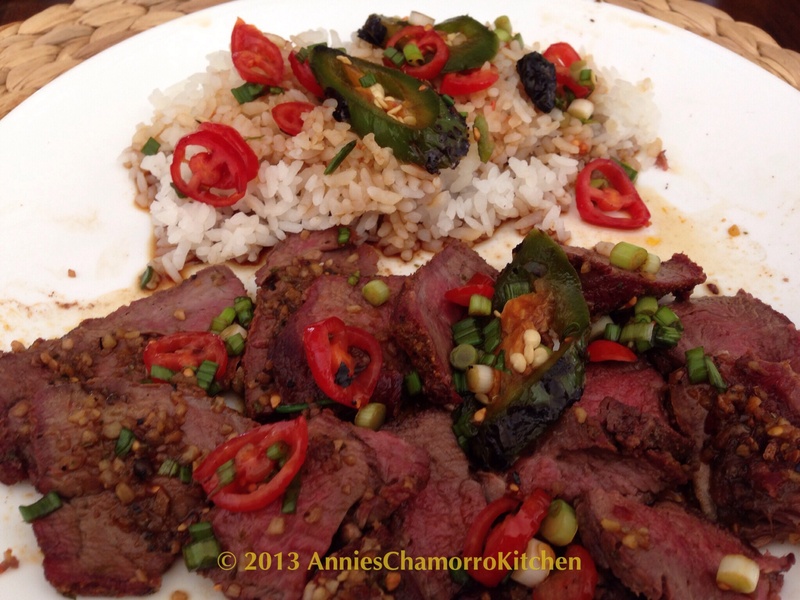 You don’t have to char the peppers, but doing so brings out so much more of the pepper’s flavor. 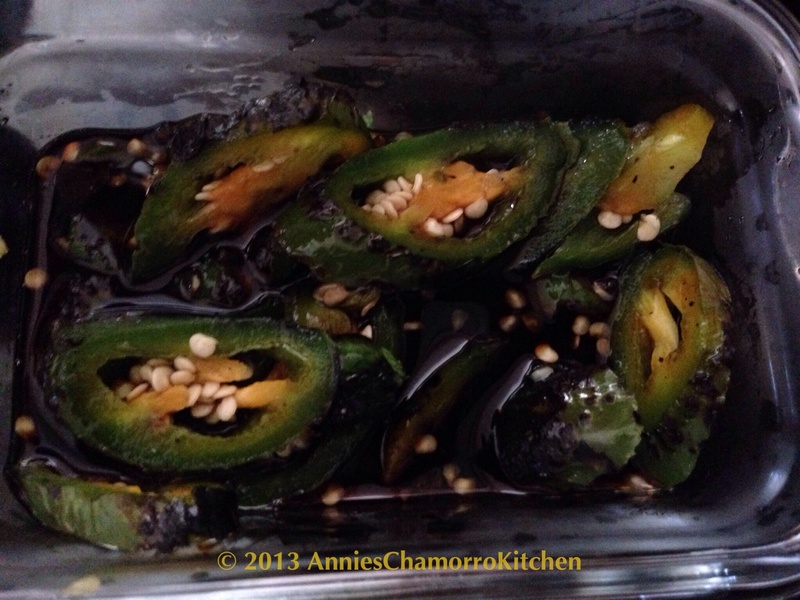 I grilled these peppers over the flame of my gas stove. Use a metal skewer to keep the peppers together; it also makes it easier to turn the peppers over to ensure even grilling. My mom and one of my sisters loves using the red, super-hot Thai peppers in their fina’denne’. Those are great too, but beware! Those suckers are MOUTH-ON-FIRE H-O-T!!! Slice the peppers then add them to the bowl. Add the onions. 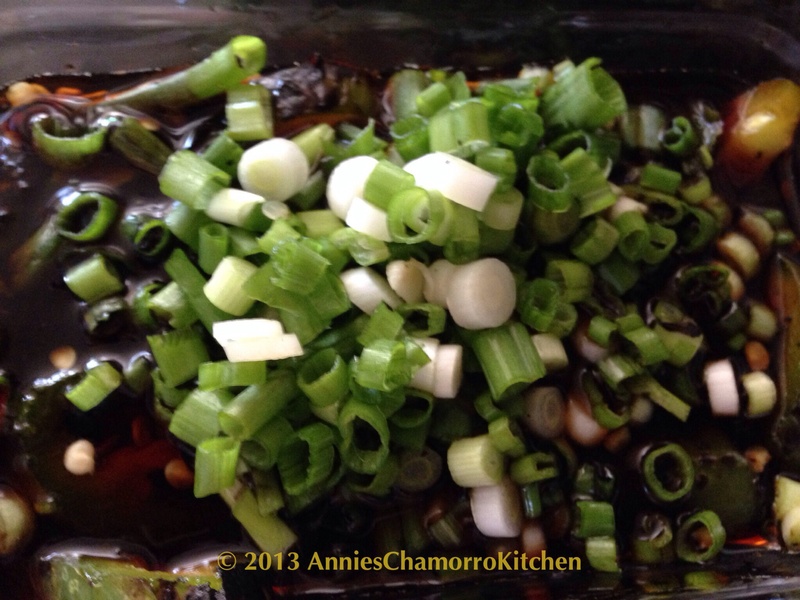 I used green onions here, but you can use white or yellow onions too. Here’s a great tip: for fina’denne’ at your fingertips and ready when you want it, buy a plastic squeeze bottle and fill it with fina’denne’, the liquid mixture only. Squeeze bottles are sold at most grocery stores, but I bought this one at our local Korean store. Add onions, tomatoes and peppers on the side when you’re ready to serve up your meal. My family and I lived on Guam for three years back in the early 80’s. Fell in love with the culture, food, scuba diving, ‘boonie stomping’, and climate. Very excited to try out some of your recipes. Do you make and sell batches of donne? I love fina denne!! Brings me back to my Guam days! Miss the island…such a happy time Thanks for the recipe! 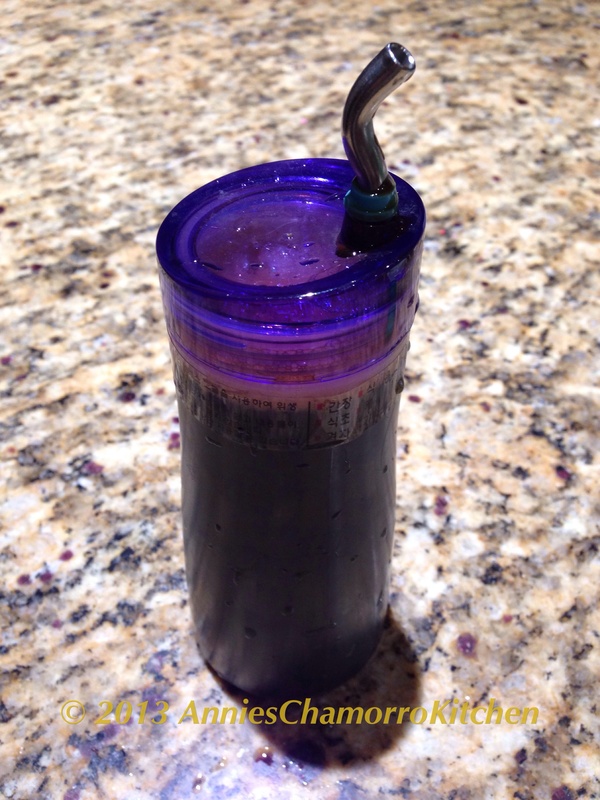 I like to use a 1QT glass bail-and-stopper bottle for my ‘denne, and am able to keep it sealed on my countertop with the cooking oils and spices. It’ll keep for a long while without refrigeration. 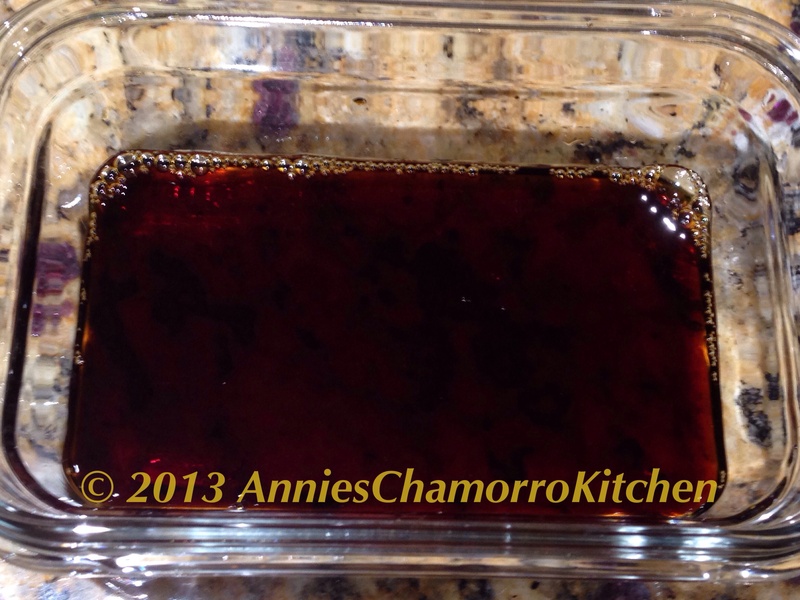 Between the acidity and oil from the peppers, not much will live in there. (Not that it goes that long without being eaten, anyways.) Great recipes, Annie!! Thanks for hosting an amazing site!! You can also use the small Patron or any small bottle with a cork to store it in. I just returned from Guam and was while there was unable to find a “recipe” for “Finedene” although I did buy a bottle of commercially prepared sauce [I have yet to try]. I was very happy to see your recipe, and now understand why every person I asked about it would give me a different description [and spelling] of this great sauce. Thank you. Hafa Adai, Tom! I’m glad you now have a basis for which to make your own fina’denne’. Make it your own by using vinegar, or lemon juice, or lime juice. Make it spicy or not, or add other condiments. The sky’s the limit! Trevor, if it’s just the liquid without any additions, it can last a few weeks. If you add optional ingredients such as onions or tomatoes, it will keep fresh for a week or so. I recommend making a fresh batch each week.